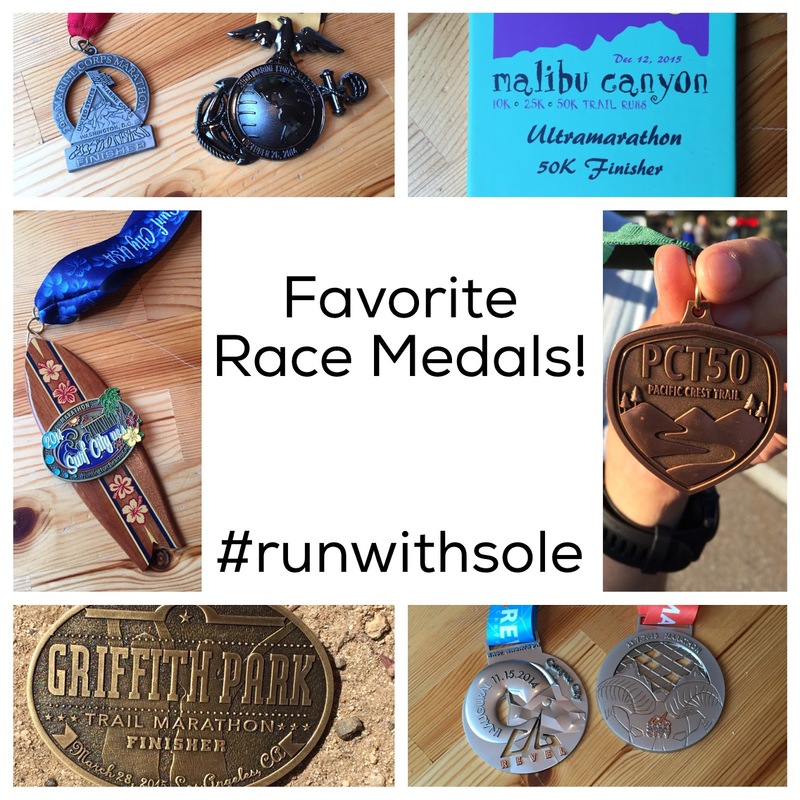 Runs with Sole: Will Run for Bling! Races have become so much more than just the race itself. People are signing up for the goodies they get like awesome race shirts, race bags, post-race food and beer and, of course, the medal. That medal is the carrot that we all run after, motivating us to finish the race. We wear our race medals proudly, we hang them up, we decorate our Christmas trees with them and so much more. Some medals are better than others and that's what we're talking about today! 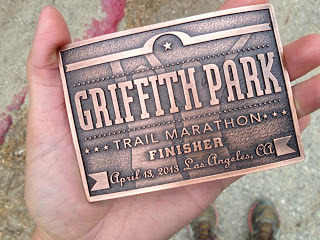 I'll admit, while I like the race medals, they're not usually the thing that draws me to do a race. But I kind of like the fact that medals are getting bigger and more exciting. As I was going through my medals for this post, I noticed how puny and pathetic the older medals are. For instance, here are two of my Marine Corps Marathon medals. 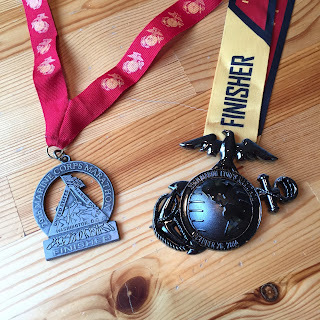 The Marine Corps Marathon was my first marathon in 2004. I ran it again after my first baby in 2006 and then I ran it again in 2014 to celebrate my 10th year of running marathons. In the pic below, the one on the left is from 2004 and the one on the right is from 2014. They're totally different medals and the newer one is quite the improvement!! My Marine Corps medals are definitely favorites simply for sentimental reasons. 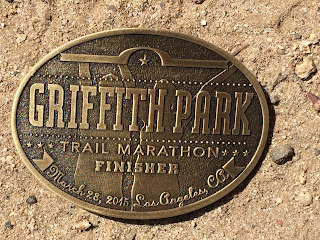 My two 50-miler medals are also sentimental favorites. I'm just really proud of myself for finishing the two hardest races I've done. 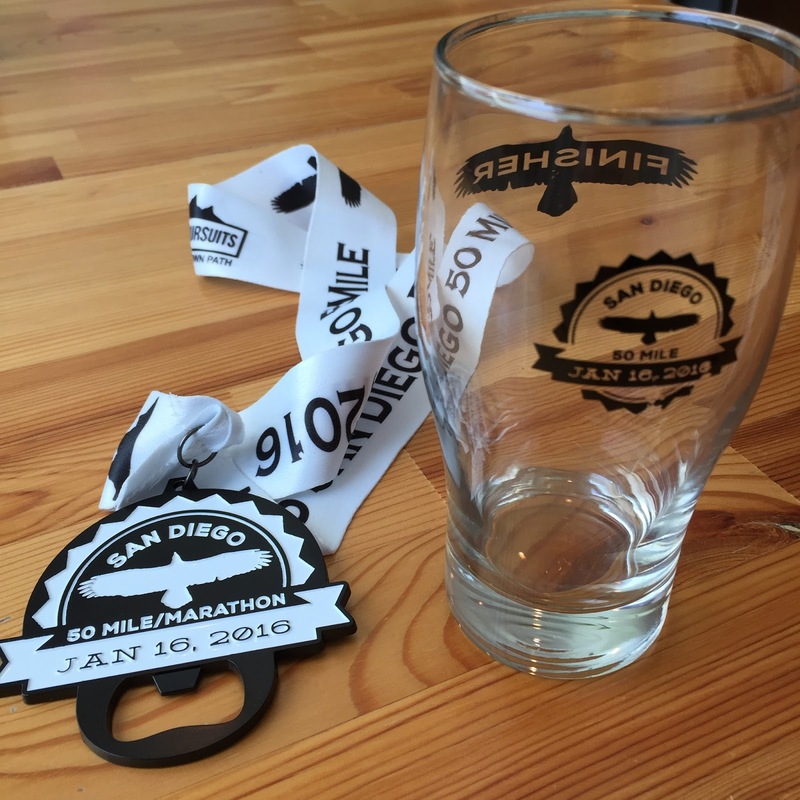 Bonus glass for the 50-miler finishers! 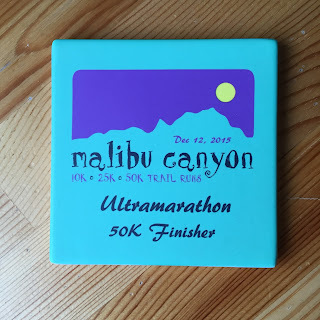 My other non-medal is the coaster from the Malibu Canyon 50K. It's ceramic and it sits on my counter, so it's my only race "medal" that I see every day. It's a constant reminder of a race I really loved! 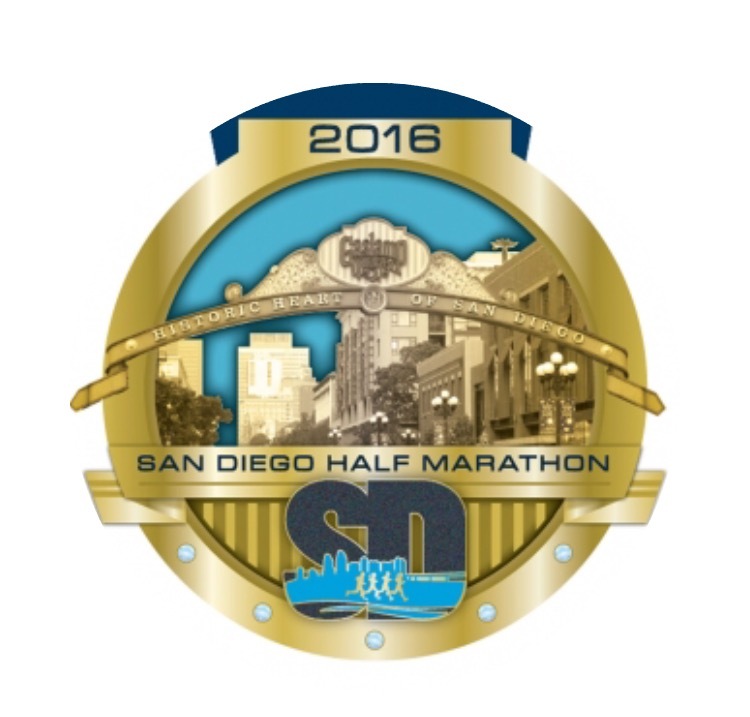 I am looking forward to earning the 2016 San Diego Half Marathon medal. 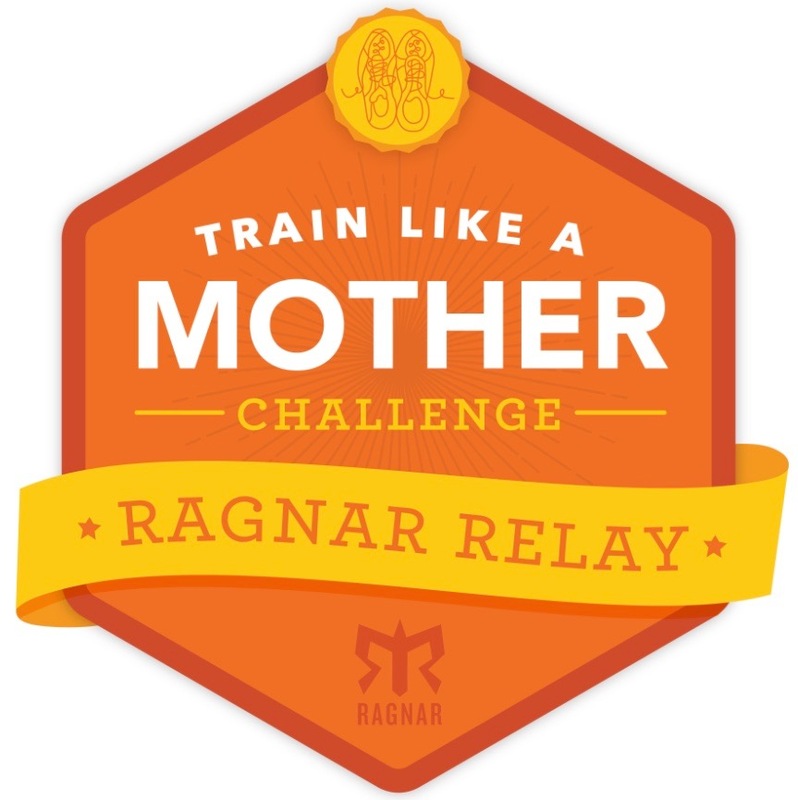 I have run this race every year since its first year, which makes me a 5-year legacy runner. The 5-year legacy runners get a jacket this year, which I'm super excited about. 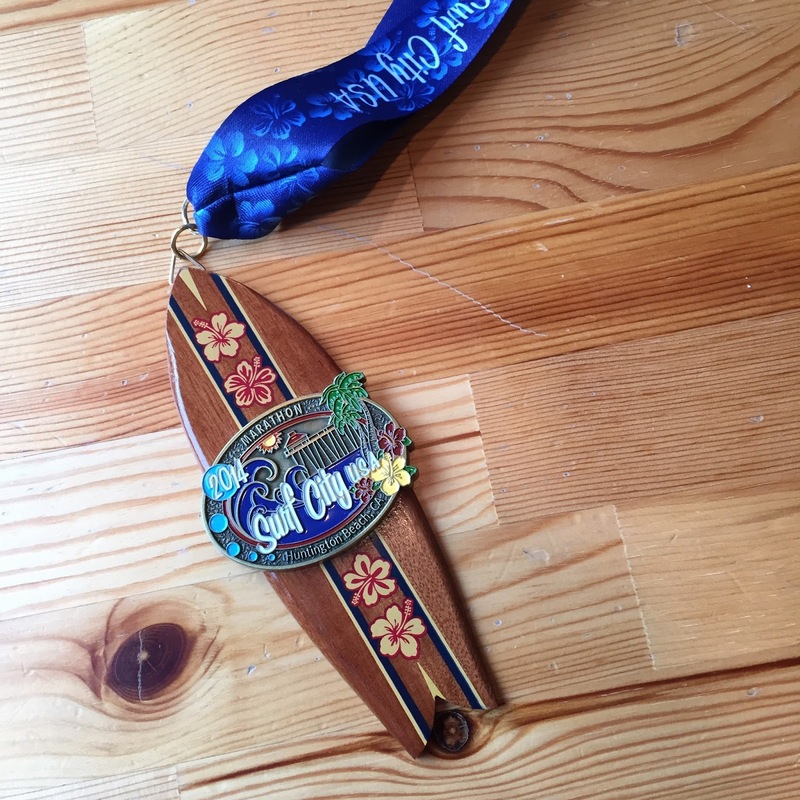 And the 5-year medal is super cool with a jewel marking each year of the race and a pretty outline of the Gaslamp district of downtown San Diego, where the race finishes. It looks really cool and I'm looking forward to getting it in a few weeks! 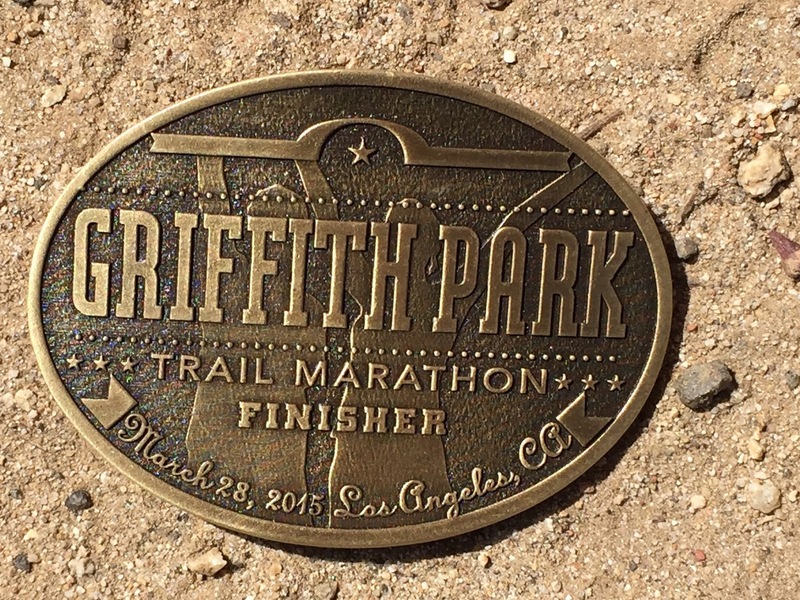 What are some of your favorite race medals? 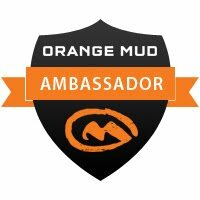 Are there any that you haven't earned yet but are hoping to? Let me know! Lots of great medals ! LOVE the surfboard one. The medals in France are very very basic. Similar to the ones you received 10 years ago ! 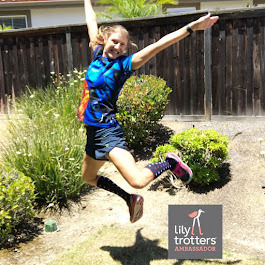 I am running my first marathon in 6 weeks... and am so looking forward to that medal ! You're doing the Paris Marathon, right? I'm sure that one will be gorgeous!! Hello from the blog hop! I really like the surf board medal! So far my favorite one is from my first half marathon. It's a huge crown! 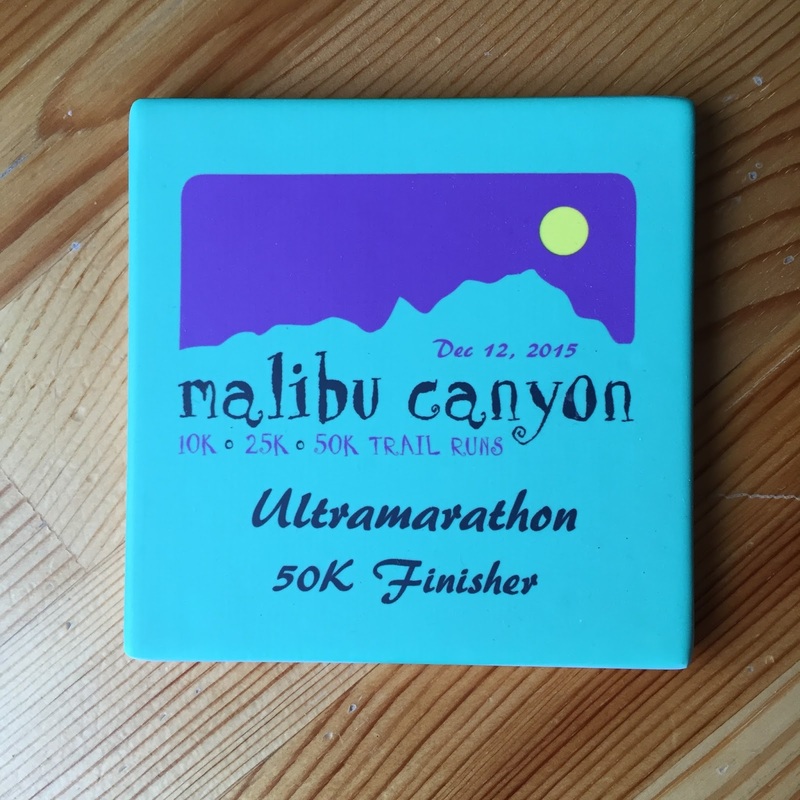 The one I'm wanting is from my first marathon in going to do in April. I just want to finish and that medal will show me I did it! Hello fellow hopper! What was your first half marathon? I like crowns :) And good luck on your first marathon! Which one are you doing? Wear that medal proudly!! 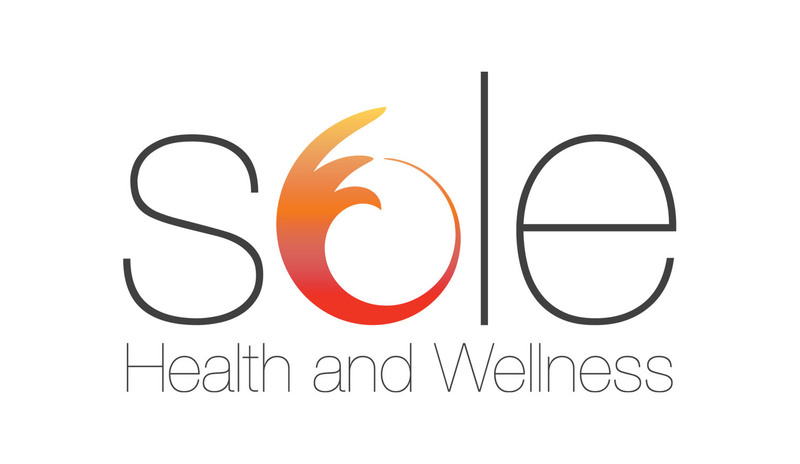 Bigger and more exciting! Bwahahahaha! I am over the medals. I want pint glasses. Or coffee mugs. I agree! I don't always see the medal before the race and it's always a nice surprise! The MCM one is great! Now that's a medal! 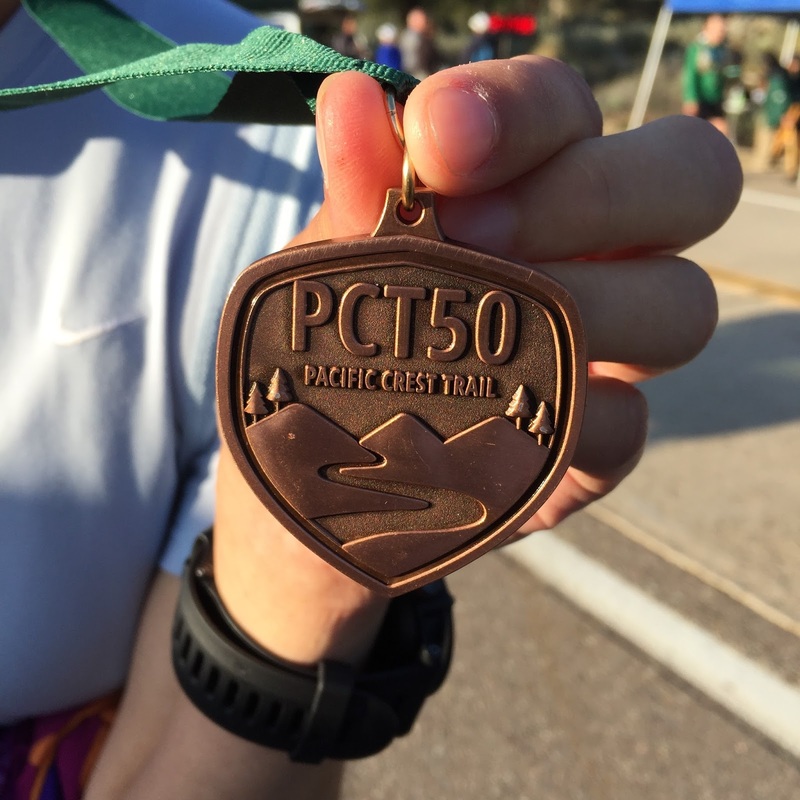 Conrats on all your races; you've collected some great medals. For sentimental reasons, I like my Rock N Roll Las Vegas Half Marathon medal more than the others because (a) it was my first RnR event; and (b) it was simply a miserable race at night, with temps dropping into the mid-30s by the end of it, so I feel like I worked hard for it. Were it not for the company I kept for most of the miles ;), I'm not sure I would have made it through. 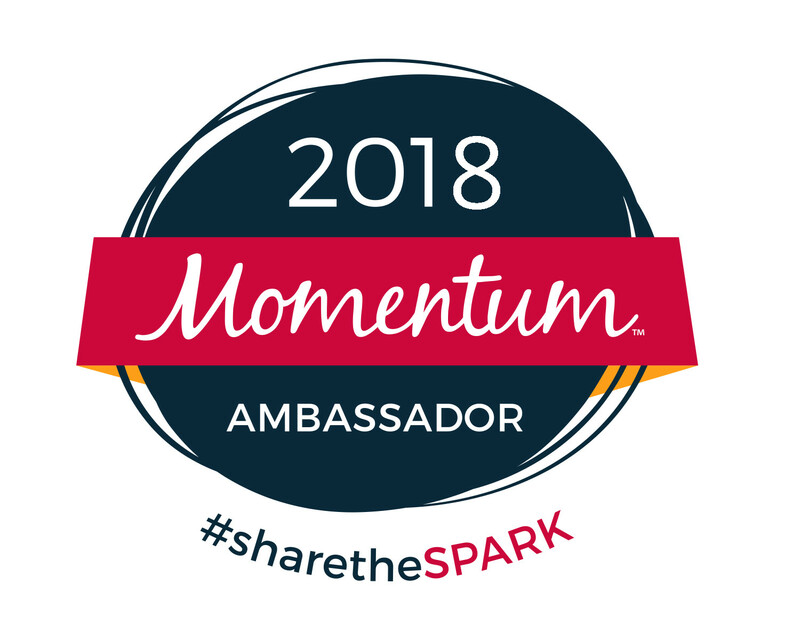 I love all of my medals, though, and I need to keep earning more! That was a tough race. But it was such s good weekend, the race was kind of secondary. And you do need to earn more and I hope I can be there for some of them! I covet your MCM medal! It's one of my faves. Alas, not in the cards for me anytime soon- but it's AWESOME. Thank you!! Hopefully you'll get that medal in the not so distant future! Have you bought/built something to store your medals? I haven't. I don't know where I would hang them. I should do something with them, though. I worked hard for them! Love your collection. 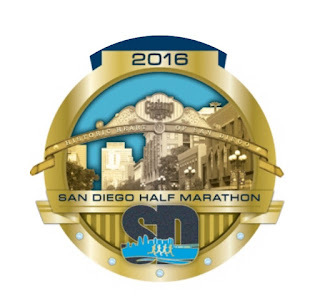 Like that you'll get a jacket for the San Diego half this year, that's pretty awesome. 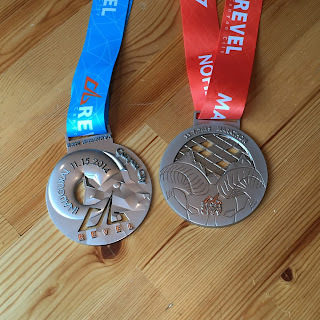 Love this post and your medals! It's cool to see the old and new Marine Corps medals. Marine Corps definitely ranks among my favorites (I have 2013 and 2014), as well as Las Vegas and Flying Pig! Can't wait to see the San Diego one for real! Wow! I love seeing all of the different medals you've earned! 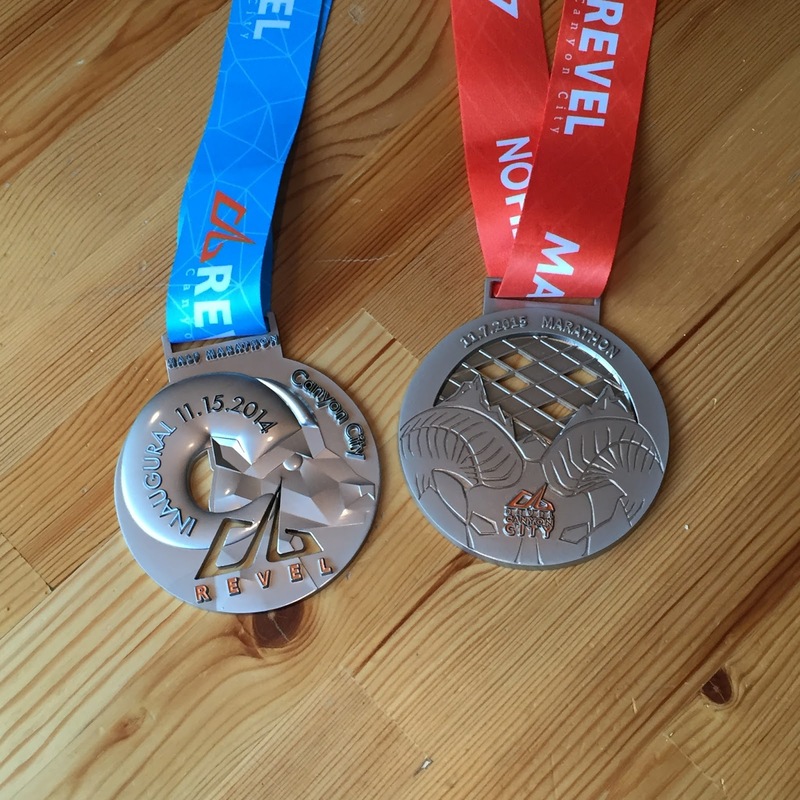 I'm not a big runner but I am super-proud of the few medals I have earned. And I totally agree - they are getting bigger and flashier each time! Stopping by from the blog hop! Love the collection...especially the surf board. 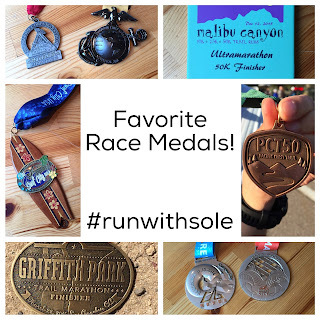 I only typically keep the cool medals or medals from races that mean something to me. Now I am starting to feel kind of bad that I didn't keep them all! I love the surfboard medal and the coaster! I'm with you, bling is nice, but that won't get me to run a race. But I particularly like meaningful bling like that coaster! And like my blue/gray mug. I love this post! I have been thinking about doing a post like this and now I have to! My favorite medal is my first (only) triathlon medal or my TC 10 Mile medal from the 10 mile race at the Twin Cities Marathon.